To get the most out of the book, you should at least know some form of representational drawing. In the second lesson which is about line drawing, it suggest that you draw what you see outdoors, so you definitely require some basic observation and representation drawing skills. The third lesson asks you do draw the view you see while riding in a car or bus, and the illustrated example is a sketchy panoramic view of a car interior. These two lessons for starters can be quite overwhelming for beginners. There are lots of interesting exercises to try out, such as drawing in the sand, on a steamy window, use needle and thread to draw, draw under a minute, poke holes, draw from a low point, high point, visually record the decomposition of some food item, doodle on photos from magazines and newspapers, draw in the dark, still life, draw tone squares, cutting up your drawing and rearranging them, and many more. Throughout the book are suggestions on things you can draw. The authors Sam Piyasena and Beverly Philp have written a book that's informal, casual and easy to follow. The overall goal is really to have some fun, build up some freedom and creativity to your drawings and what you can draw. 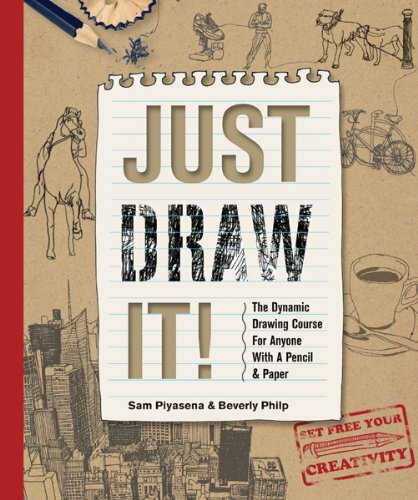 It's a good book to get you back into drawing, or to start drawing differently.